At one point or another, every Camino alum starts making Top Five list. The Best Albergues. The Best Meals. The Best Days. I love reading these stories, because sometimes I recognize the places they describe…but more often I don’t. Pilgrims stop in different towns, or stay in different places, or the weather and the people just give them a different experience. 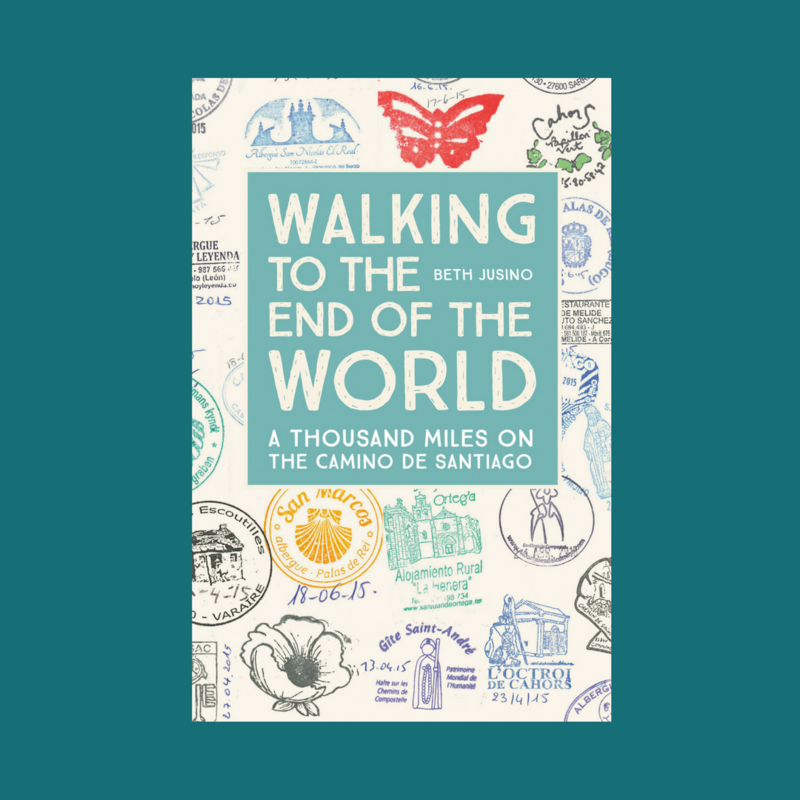 There are a million ways to walk the Camino. So I don’t claim that these five are “the best” albergues on the Camino Frances, but here are the five places that I’ll never forget, in the order I encountered them. Despite the fact that I spent two lovely days here, I never took a single photo. Blame the stomach bug. I’d picked up a nasty stomach bug as we walked across the Navarre region, and was still feeling weak and nauseous when we arrived in Viana. We stopped at the first albergue we saw, Izar, a spacious, clean, modern townhouse with a well-stocked, open kitchen area for preparing meals, and a sunny rooftop deck for lounging and napping. So much communal space encouraged pilgrims to relax and visit. The patriarch of the hostel was a grandfatherly man who spoke only Spanish, and who cooked for his family in the same kitchen the pilgrims used. After a long nap, a mild dinner, and some good conversation, I was finally feeling better…but then Eric came down with the same bug that I was just getting over. Not to be graphic, but this meant we would need to stay off the trail and close to bathrooms for a day or two. So the next morning I approached our host and, in broken and terrible Spanish, explained the situation. Could we stay here for another day, perhaps move out of the dorm and into one of the private double rooms, so that Eric could rest? Of course, he said. No problem. Although it was only eight in the morning, they had a room cleaned and ready for us in 15 minutes, and Eric settled in to let his gut heal. That evening, the patriarch insisted on making us a “healing soup”—a salty broth with rice and bunches of his own fresh herbs. And when he found out we needed to be ten kilometers away in Logrono the next day to meet a friend, and the buses weren’t running, he arranged for someone to drive us there. I’ve written about our night in Rabanal, the town of heavy stones and good soup, already. The Refugio Guacelmo, run by the British Confraternity of St James, is open only to unsupported walkers (no baggage service or bike teams here, and no reservations), and so at the end of a rainy day all of the pilgrims arrived with dripping backpacks and soggy sleeping bags, soaked to the skin after a long day of hiking in steady rain. The volunteers welcomed our straggled, hungry group with humor and efficiency. They had piles of newspapers to dry our shoes, and lines sheltered under porches to air out our wet things. (They also had a huge, open lawn that I suspect is a lovely place for tired pilgrims on sunny days.) One of our hosts, a woman who bore more than a passing resemblance to Dame Judi Dench, watched Eric strip off his soggy socks. She didn’t comment on the mud he dragged in, but instead complimented, as only the British can, his “gorgeous-shaped toes.” They served tea at five, and of course the monks from next door dropped by. That evening, after more soup and wine, we made our way across the street to listen to those same monks sing vespers by candlelight in a humble and ancient church. The whole thing felt like my earliest dreams of what the Camino should feel like. We walked to Villafranca de Bierzo, deep in the rolling hills between Leon, Castile and Galicia, without knowing where we wanted to stay. The guidebook mentioned two albergues on the edge of town, both which had mixed reviews. Neither felt right. Then, about five kilometers outside town, I noticed one of the ubiquitous fliers stuck to trees and fence posts, advertising the next town’s bars and lodgings. Albergue San Nicolas, it said, was a brand new albergue for pilgrims. It was the picture that caught my eye. Were those twin beds? Yes, the sign specifically bragged that there were no bunk beds. I was sold. But where was Albergue San Nicolas? There was no address on the sign, and it was too new to be in our guidebook. At the end of a long day traversing rolling hills, the last thing I wanted to do was go wandering in circles all through a town. Should we just play it safe and stay in the place in the guidebook? But wait, there was a Convent San Nicolas here on the map, a historic monument dating back to the seventeenth century. Maybe Albergue San Nicolas would be near that? The risk turned out to be worth it. To our surprise and delight, Albergue San Nicolas isn’t just NEAR the convent. It IS the convent. The Church has sold the building to private owners, who are converting it into a hotel and albergue. The building is cavernous and beautiful, with wide cloisters overlooking the courtyard, high ceilings, and bright murals on the walls. There’s a friendly bar with a good patio, and it’s just a few blocks from the main square, full of open-air restaurants and outdoor markets. For eight euros each, we had twin beds in a spacious corner room, shared with only one roommate. And a private bathroom! This was, by far, the most luxury we experienced in an albergue anywhere in Spain. From Villafranca de Bierzo, most pilgrims hike along the road through the valley and then, at the end of the day, up a steep mountain to the popular tourist town of O’Cebreiro, at the edge of Galicia and one of the highest points of the Camino. But after we added few extra kilometers in the morning by taking a scenic detour along a quiet ridge line (completely worth it), we decided to break up the rocky mountain climb, made slick in an afternoon rain shower, by stopping in the tiny hamlet of La Faba, about five kilometers short of the summit. La Faba has maybe thirty residents, an equal number of cows, and an albergue run by the German Confraternity of Saint James. 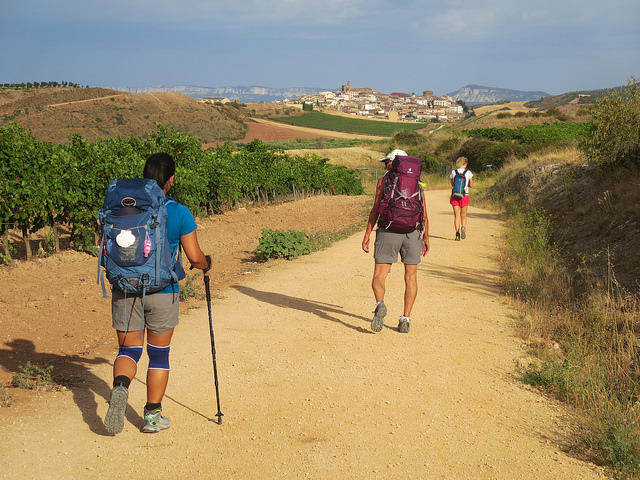 (The Germans chose to serve the Camino in La Faba because of an centuries-old German poem that eulogizes the German pilgrims and pious men who died on the way to Santiago. One of the lines basically reads, “The sons of Germany are buried in La Faba” — a phrase that they replicated, rather morbidly, in their credencial stamp.) The albergue is tucked at the end of an overgrown lane, built where the rectory once stood next to the local church. The rain left a chill in the air, even in late June, but inside the stone chapel a bank of prayer candles made the small space warmer. We lingered there in the dark for a long time…there wasn’t much to explore in a town with only one cafe and a shop the size of my sofa at home, and the albergue had quickly filled to capacity. The predicted crowds descended on us in Sarria, as thousands of people join the Camino for the last 100 kilometers.We’d been traveling for 72 days, we’d had a rough night in Palais de Rei surrounded by nightlife-loving, hair dryer-using tourist pilgrims, and my “practice acceptance” zen was wearing thin. But then we stopped in Ribadiso. It was a hot, sunny afternoon in late June, and the municipal albergue in this little village just short of Arzua is tucked on the bank of a stream that’s just the right depth for wading on a hot summer afternoon, in the shadow of one of the Camino’s perfect stone bridges. It’s unusually picturesque for a municipal, a cluster of stone buildings that was a pilgrim hospital centuries ago. The low ceilings and rough wooden floors in the sleeping area stayed cool against the sun, and there were nooks and corners everywhere to explore. Most of the crowds (especially the newcomers) went on to the bigger city of Arzua, and I spent a lovely, quiet, lazy afternoon lounging in the grass and watching the cows graze just a few feet from the bathroom pavilion, and then sipping sangrias on an outdoor patio at the only bar in town, while chickens pecked under the tables like they were city pigeons. With just a few days left to Santiago, and in the warmth of the long summer evening, everyone was feeling festive and free. we caught up with friends we’d met a month before, and heard a few new stories, as well. As the sun went down a group of young pilgrims pulled out guitars and sang under the stars, on the banks of the stream. How about you? Where are the albergues you’ll never forget? This was hilarious! “hair dryer-using tourist pilgrims…” Thanks for keeping me a subscriber! (Even if you hate the crazy me) I still really like your blog posts. This is a great reference for me as a future hospitalera for what makes a good experience. Gracias! Lisa, how lovely! I’m hoping to be a hospitalera someday, as well. Do you know yet where you will be working? Couldn’t agree more about Izar and his albergue. Great place!